While the genetic disease received widespread attention during the Civil Rights Movement, researchers and doctors say patients continue to suffer from a lack of adequate treatment. Treyvonn Chadwick receives monthly apheresis treatments, which help prevent strokes and alleviate severe pain, at Children’s Hospital Oakland. For La Chondra Rhymes, growing up with sickle cell meant hiding her disease — and silently suffering through the pain that came with it. Rhymes said her aunt, who became her legal guardian after her grandmother passed away and she was briefly placed in foster care, did not want to take her to the hospital when she was in bouts of pain, even though her aunt was a nurse. Embarrassed of her disease, Rhymes sought solace in school, where she excelled. At age 16, Rhymes ran away from home. But her disease continued to progress. When she was 20, she developed arthritis. She also had a stroke and a minor heart attack in her early 30s. Now, at age 43, she deals with pain nearly every day. "I feel like I have the body of an 80-year-old," she said. Although once ashamed of her disease, Rhymes is speaking out about her affliction. "I used to be so embarrassed," she said. "Now I don't care if people know that I have it. I think it's more important to educate people about sickle cell." An estimated 100,000 people in the U.S. live with sickle cell disease. The genetic disease — which primarily affects African Americans — changes the shape of a person's red blood cells, which are responsible for transferring oxygen throughout the body. In a patient with sickle cell disease, the red blood cells are sickle-shaped, which can block blood flow. This often leads to neurological impairment, renal failure, and bone disease. Sickle cell can also cause severe pain. About 50 percent of adult sickle cell patients have daily, chronic pain that "affects their ability to work, young people's ability to go to school," said Marsha Treadwell, a clinical scientist in the Department of Hematology/Oncology at UCSF Benioff Children's Hospital Oakland and director of the Sickle Cell Care Coordination Initiative at the hospital. "And there are life-threatening complications." While sickle cell received widespread attention in the '60s and '70s during the Civil Rights and Black Power movements, the disease has mostly fallen off the radar of the general public. Although the treatment of pediatric patients improved immensely in the ensuing decades, the number of facilities with quality care for sickle cell patients remains extremely limited. And when adult patients don't have access to a specialty doctor or clinic, they often end up in the emergency room, where medical professionals may not have experience in treating sickle cell symptoms. Because the disease primarily affects African Americans, the dearth of treatment options is considered a legacy of slavery and racism. "The origins of sickle cell disease are abuse, neglect, and racism," said Elliott Vichinsky, director of Hematology/Oncology at UCSF Benioff Children's Hospital Oakland. Another major obstacle to care is that most sickle cell patients in California are on Medi-Cal. Treadwell noted that the Medi-Cal reimbursement rate "is really very poor," and that 70 percent of providers in the U.S. don't even accept Medicaid. Sickle cell patients in the Bay Area have been more fortunate: UCSF Benioff Children's Hospital Oakland is home to one of the oldest and most respected sickle cell centers in the country. Few places have a comprehensive sickle cell treatment center like the one in Oakland. 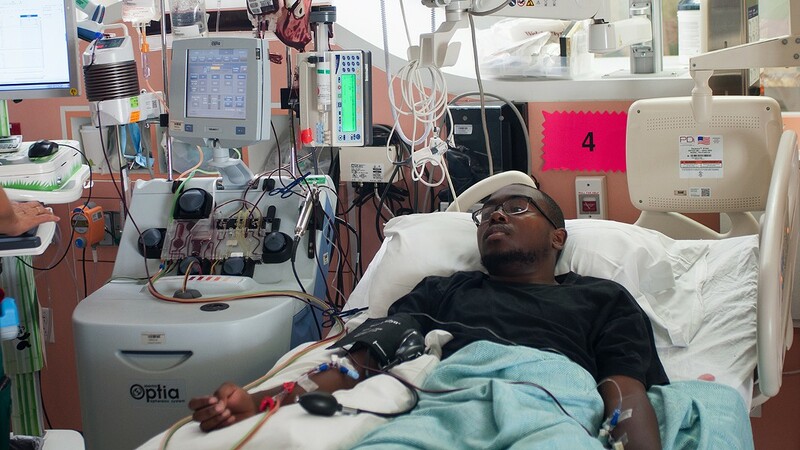 Annually, the Northern California Comprehensive Sickle Cell Center at UCSF Benioff Children's Hospital Oakland treats roughly 800 sickle cell patients annually, nearly half of whom are adults who have been going there since they were kids. About 70 percent of the hospital's patients are on Medi-Cal. After running away from her aunt's house, Rhymes began receiving care at Children's Hospital Oakland. (She had also been treated there before she lived with her aunt.) She also attended the summer camps put on by hospital staff. "We'd pick our outfits out a year ahead — we were that excited about it," she said. At camp, among other children with sickle cell, Rhymes didn't have to hide her disease or feel ashamed. For Rhymes, and countless other East Bay sickle cell patients, Children's offered much more than medical care. "I've been going to Children's Hospital since I was one, so they really know me," Rhymes said. "Being in foster care and not really having a core family, they kind of became my family." So, about six months ago, when word spread at the hospital that UCSF was going to shutter the researching portion of Children's Hospital, Children's Hospital Oakland Research Institute (CHORI), doctors and patients were alarmed. The closure would have hurt critical research on sickle cell, which, in turn, would impact care, doctors said. "CHORI has had a focus over the years in developing and integrating research projects that are synergistic with sickle cell treatment," said Vichinsky, who is the director of the Northern California Comprehensive Sickle Cell Center at UCSF Benioff Children's Hospital Oakland, where he has worked for nearly 40 years. Interviewed in February, Vichinsky said he was "very insecure about the whole situation." After some public outcry and consideration, however, UCSF recently told the Express that CHORI would not only remain open, but is "preparing to enhance and grow clinical and translational pediatric research programs at the Oakland campus," according to Michael Anderson, president of UCSF Benioff Children's Hospitals. While that's undoubtedly good news for local sickle cell patients, adults with sickle cell continue to die prematurely across the country — including in California. "We have more deaths of individuals under 30 than anywhere else in the country," said Mary Brown, president and CEO of the Sickle Disease Foundation of California, the oldest sickle cell foundation in the U.S.
"Children get the best care possible, no doubt. It's when that child becomes an adult, that's when they fall into a black hole."